Last year we loved Alpinestars’ Stella Motegi suit, you may recall seeing it among our 2104 ZLA Awards. This year, Alpinestars has brought it back with an all new zest. The 2015 redesign has us excited to see if the suit can maintain its spot as the go-to entry level suit for female riders everywhere. Offered in the one-piece version and now a two-piece version, the Stella Motegi finds a great middle ground between comfort and performance. This is the perfect suit for new track riders or women seeking full body protection who are not traditionally comfortable in a race suit. 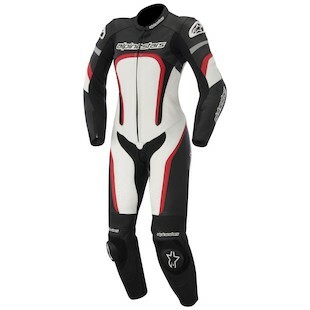 From its predecessor, the new Alpinestars Stella Motegi Suit now has additional stretch paneling at the elbow, the now Polyamide shoulder stretch panel stretches farther down the torso, additional stretch panels have been placed on the torso and extra stretch has been provided at the knees. Wow, that is a lot of extra stretch! Why, you might ask? The added stretch provides the rider with additional comfort in the flexibility of the suit and a less restrictive ride, enabling freer body movement both on and off the bike. It also allows women of various body shapes to comfortably wear the Stella Motegi. The new Motegi also has a modified perforation pattern that reduces the perforation in the suit (more so for the Alpinestars Stella Motegi 2-piece race suit than the 1 piece), improving the overall integrity of the leather. Now, the suit is directly vented through the speed hump. Did I mention that the speed hump is aerodynamically sculpted and ergonomically designed specifically for the female form?! Super cool. Form and function go hand in hand with the upgrades of this suit as we see that the Stella Motegi has also been equipped with updated protective components. The elbow and shoulder armor has been replaced with Bioarmor. The foam hips are now removable and can be replaced with the Betac Hip Protectors with built-in Velcro adjustment. Additional PE foam is integrated on the chest, hips, and coccyx. And, of course, the suit’s updated removable liner (with a waterproof pocket!) 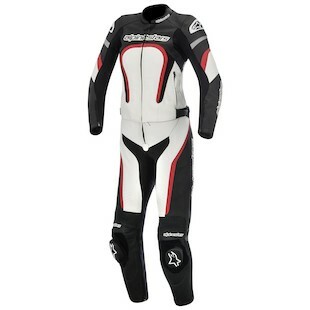 is equipped with the snap connection system that allows for integration with Alpinestars’ CE Level 2 Bionic Race Back Protector. The Stella Motegi’s fit make it an excellent choice for women of all shapes and sizes. Its attractive tag, putting it right around that $900 price point, ensures that riders can get into full body protection for little more than their tax refund. Women looking into getting their first race suit or a protective but inexpensive replacement for an older suit should look no further than the Stella Motegi.